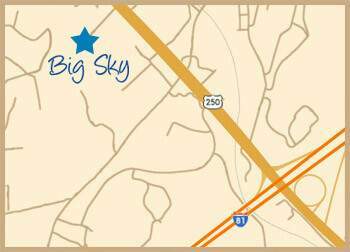 Big Sky Apartments in Staunton, Virginia is professionally managed by Park Properties Management, Co. If you have questions or comments, or would like more information about our apartment homes in Staunton or other parts of Virginia, please use the information below to call, send an online request, write, or even visit us! From Interstate 81 take exit 222 toward Staunton. Merge onto US 250 West (Jefferson Highway) toward Staunton / Mary Baldwin College. Proceed approximately one (1) mile to Community Way.